Elevate your message of equality and empowerment using Canva's poster templates and design tools. While the world has achieved progress towards gender equality and women’s empowerment under the United Nations’ Millennium Development Goals, women and girls are still not able to participate fully and access equal opportunities in many parts of the world. At its heart, gender equality is all about human rights and creating a peaceful, sustainable and empowered world. Whether you’re creating a poster to organize a movement, announce an event, or simply to raise awareness on the issue, Canva can help you communicate your message in an effective and visual way. Start with one of our customizable templates or create your own through our simple, drag and drop design tools. 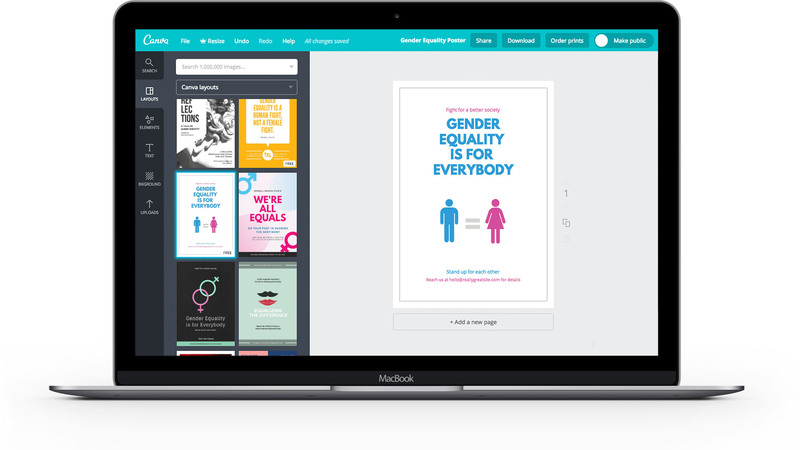 Create a new Canva account to get started with your own gender equality poster design. Posters are a visual tool so make sure you have a compelling image to carry your message of gender equality. Browse through Canva’s amazing media library—filled with over a million images, illustrations, icons and photos—for the perfect poster visuals, or upload your own. Add any JPEG, PNG or SVG file from your computer then drag it to your design canvas. Once uploaded, images are kept in your uploads folder, ready for use in other designs. With a vast collection of template layouts at your fingertips, designing in Canva means you won’t ever have to start from scratch. Take your pick from our collection of ready-made, professionally-designed posters on gender equality, then edit and customize to suit your needs. From text to colors to images, everything can be changed, moved around, and modified to fit your message. You can even design on the go by adding Canva to your iOS or Android devices. Head over to the App Store or Google Play to download our mobile apps for free. It takes effort from everyone to achieve an equal world and your poster can be a starting point for that collaboration. Canva make sharing your design with your colleagues or friends to get their feedback or input easy. Just click on the “Share” button then invite people to view or edit your design either by sending them an email invite or by sending them a direct link to your poster. Once you’ve got your poster looking just right, it’s time to share your message with the rest of the world. Send your poster straight to Canva Print and we’ll take care of producing it with the best color, paper and finish quality. We’ll even deliver it right to your doorstep. Gain even more traction by posting your gender equality poster online such as by posting it on your Facebook or Twitter accounts, or by embedding your design on your website. How can I format the text for my poster design? You can edit your text in a variety of ways to make sure it fits your design needs. Using the text tools, you can change the font type, size, color, emphasis, alignment, spacing, and transparency. You can also turn your text into a bulleted or numbered list. Changes are applied to all text within a text box. To apply any of the above changes, select the text box you wish to edit and click on the format options found in the text tool. How do I upload photos to Canva? On the design editor, select “Uploads” from the left navigation bar, then select “Upload your own images”. Canva even stores previously uploaded images for easier use in the future. If you’re part of an organization, it can be a good idea to add some branding elements to your poster design. You can achieve this by uploading your logo, using your brand color palette and consistent fonts. To upload your logo, click on the Uploads tab in your object panel, select the Uploads folder, and click on the green Upload your own images button. Select any PNG, JPEG or SVG file you wish to upload from your computer.